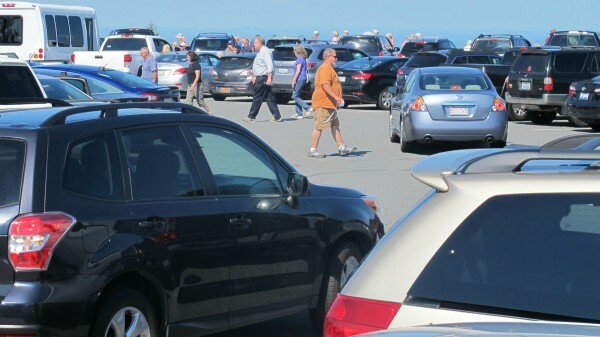 Cars and pedestrians crowd the parking lot about noon Wednesday at the summit of Cadillac Mountain in Acadia National Park. Seasonal traffic congestion at the top of Cadillac, which has resulted in the summit road temporarily being shut down four times this summer, is one thing park officials hope to address by developing a traffic management plan. Vehicles drive away Wednesday afternoon from the summit of Cadillac Mountain in Acadia National Park past a sign meant to deter improper parking on days when traffic at the summit is heavy. Congestion at the summit has resulted in gridlock so dense that the road up the mountain temporarily was shut down four times this summer. ACADIA NATIONAL PARK, Maine — In the grand scheme of things, it may not have much of an effect on the park’s overall traffic management strategy, but for the second time this year, park officials have scheduled a car-free morning in Acadia. From midnight until noon Saturday, Sept. 26, people will be allowed into the park only if they do not try to drive in. Buses with Island Explorer and with local bus tour companies will be allowed on the park’s roads, but other vehicles including cars, trucks, motorcycles and charter buses will have to stay out. 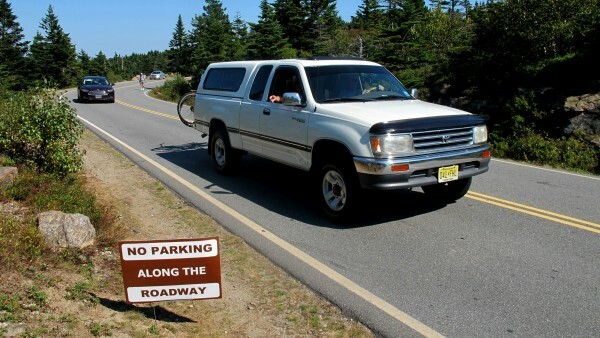 The loop road on Schoodic Peninsula, where commercial buses and large recreational vehicles are prohibited, will be open to regular automotive traffic on that day. Sept. 26 also is National Public Lands Day, which means entry fees into Acadia will be waived all day long, not just before noon. The first car-free morning in Acadia this year was on Saturday, May 16. Not having cars in the park for a 12-hour period will stand in stark contrast to other days this summer when congestion has been so bad that park rangers have had to shut down the summit road on Cadillac Mountain. Acadia officials have been holding a series of public meetings this summer in an effort to get input from the public about what it could do to mitigate traffic in the park on busy summer days. Rising visitation in general to Acadia is considered the primary reason for the congestion. Park officials said this week that the estimated number of visitors so far this year seem to be up more than 7 percent on average from last year when it had an estimated 2,563,000 visitors — Acadia’s highest annual visitation estimate since 1999. Baby boomers hitting retirement age, low petroleum prices and dry weather this summer are among the reasons for the increase in visitation, park officials have said. John Kelly, management specialist for Acadia, said Wednesday that the park does not have any more public meetings on the topic scheduled for this year, but there will be more meetings scheduled during the multi-year planning process, which should wrap up by spring of 2018. He said that for this phase of the process, the public still can submit comments online at parkplanning.nps.gov until Sept. 30. How to address the occasional gridlock at the top of Cadillac Mountain has attracted the most comments so far, he said, though parking issues at Jordan Pond and along Ocean Drive near Sand Beach and Thunder Hole also have come up more than once. Kelly said the park has not ruled out any suggestions for what might be done to alleviate congestion in the park, but he added that whatever the park does has to be consistent with its mission to conserve resources in the park. In other words, putting in airport-sized parking lots probably won’t happen. “We are strongly discouraged from impacting resources,” Kelly said. Some of the submitted suggestions include prohibiting cars in the park altogether, increasing entry fees for motorized vehicles, having more car-free days or half-days, and designating some roads in the park for bicycles only, according to Kelly. But most of the suggestions so far fall into one of two camps: expanding parking or increasing the carrying capacity for the fare-free seasonal Island Explorer bus system. Island Explorer ridership has steadily increased since its inception in 1999 and now averages about half a million passengers each year. The bus system, which last year passed the 5 million total passengers mark, seemed to brush up against its capacity limit in 2014 when it had several individual days during which the system exceeded 9,000 passenger trips — a daily milestone it had never reached in its previous 15 years. Island Explorer buses do not go to the top of Cadillac Mountain. Kelly said the Island Explorer system could be expanded with more funding, but that other measures such as bike-only roads or more car-free days would incur little to no additional cost. Whatever the park decides eventually to pursue to ease congestion, he said, likely will include several different ideas.